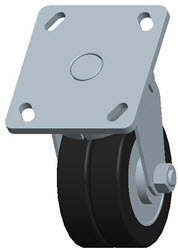 The state-of-the-art Swivel-EAZ wheel is now available in solid polyurethane with no aluminum or steel components. With stainless steel precision ball bearings, this new design is ideal for steam cleaning and wash-down applications or where excessive water or liquid is present. The split-tread wheel has independent swivel surfaces that significantly reduce rolling resistance, minimize initial start force, and result in a 35-50% reduction in push/pull forces. These wheels come in a variety of durometers to match your needs. Ideal for semiconductor, pharmaceutical, automotive, and medical equipment, as well as many other applications. Many of our Swivel-EAZ wheels have 3D models available for download in most formats, including IGES, STEP, PRO/E and SolidWorks. Select one of the fastening selections below to find the perfect wheel for any Swivel-EAZ application. If you don't see the caster you need for your unique application, please call us at 1-800-950-8750. Our knowledgeable customer service team would be happy to assist you with finding a great caster for any application. We are available Monday to Friday between 8:00am and 4:30pm (PST) and look forward to being of service.